After spirits, underground cheese lovers and ancient swordsmen, the Laika studios will lead us to discover the mythological Missing Link. Below the second and long trailer. 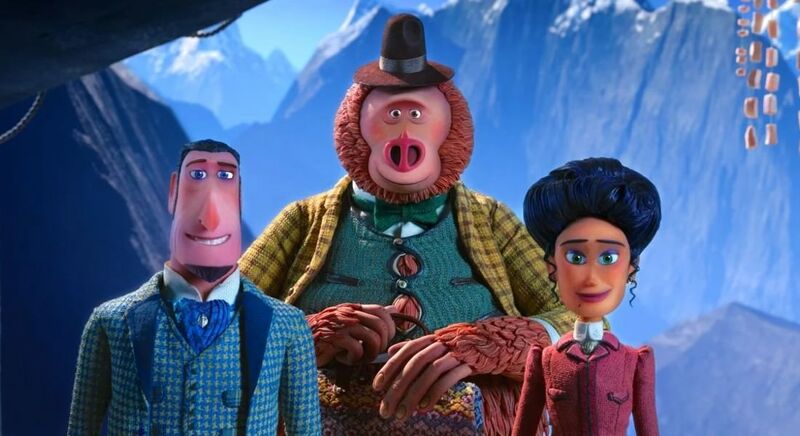 The new stop-motion feature animated film, Laika's 5th original production, is written and direct by Chris Butler (ParaNorman, Kubo), with the voices of Zoe Saldana, Hugh Jackman, Timothy Olyphant, Emma Thompson, Zach Galifianakis, Stephen Fry, Matt Lucas, Amrita Acharia e David Walliams. Main character is Mr. Link: 8 feet tall, 630 lbs, and covered in fur, but don't let his appearance fool you... he is funny, sweet, and adorably literal, making him the world's most lovable legend. Tired of living a solitary life in the Pacific Northwest, Mr. Link recruits fearless explorer Sir Lionel Frost to guide him on a journey to find his long-lost relatives in the fabled valley of Shangri-La. Along with adventurer Adelina Fortnight, our fearless trio of explorers encounter more than their fair share of peril as they travel to the far reaches of the world to help their new friend.